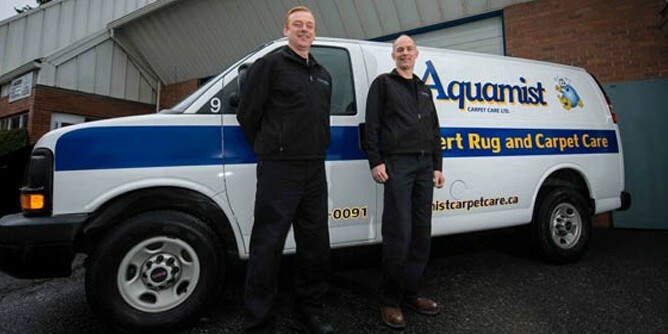 Whether you’re facing a tough problem like mold remediation or flood damage, to a more “run of the mill” problem like cleaning your wall-to-wall carpets or area rugs; turn to the experts at Aquamist. On this page you will find an introduction to all of our services. If you know what you need, feel free to give us a call, we love talking about all things cleaning! From pre-inspection to final walkthrough, we pay special attention to the tough problem areas, ensuring that you get the freshest and cleanest carpets possible. Our high-heat washing system, and 100% organic products give you the safest clean possible for your home. Every rug has a story to tell. Whether it’s a priceless Persian antique, or a machine-made cotton throw, we treat your rug with the due care and attention it deserves. You would not believe how good that old rug can look. Aquamist technicians are fully qualified and ready to handle floods, burst pipes, broken hot water tanks, and other leaks – whatever the source. Our 24-hour emergency line is open 7 days a week to ensure that expert crews will get to you quickly. Regular furniture cleaning will protect your leather and upholstery, keeping it in great shape for years to come. Our proven organic-based cleaning system gently removes stains and odors to leave your furniture looking clean and fresh. Whether it’s 100,000 square feet of office space, or your favourite desk chair, our team of trained technicians is ready to help you. We offer regular maintenance programs to keep your business looking its best. Call us for a free inspection and no-obligation estimate. The Aquamist team of professionals readily share their expertise. Avail yourself of their experience if you have questions related to any of our services, such as: flooring, flooding & remediation, area rugs, upholstery and pets.